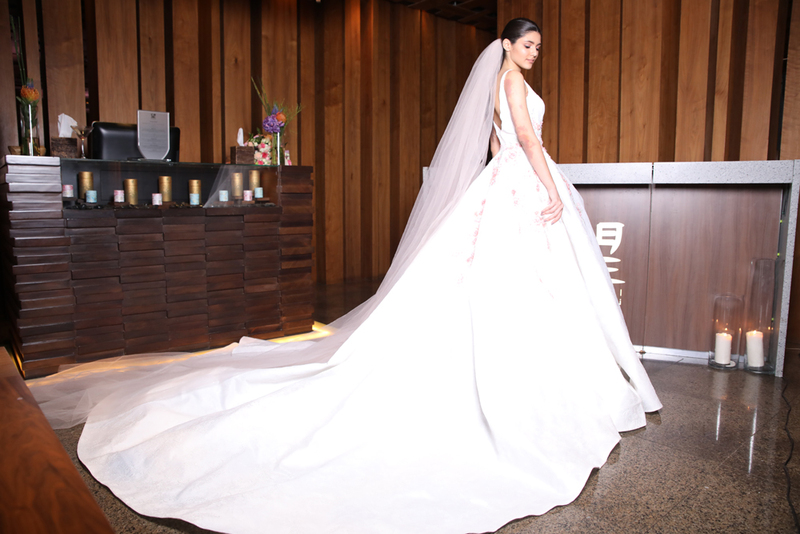 RIYADH: Nozomi, a high-end Japanese restaurant in Riyadh, was turned into a mini runway, complete with models, emerging and well-known local and international fashion designers, when the founder of the Saudi fashion community, Princess Noura bint Faisal Al-Saud, held a private trunk show on Monday. 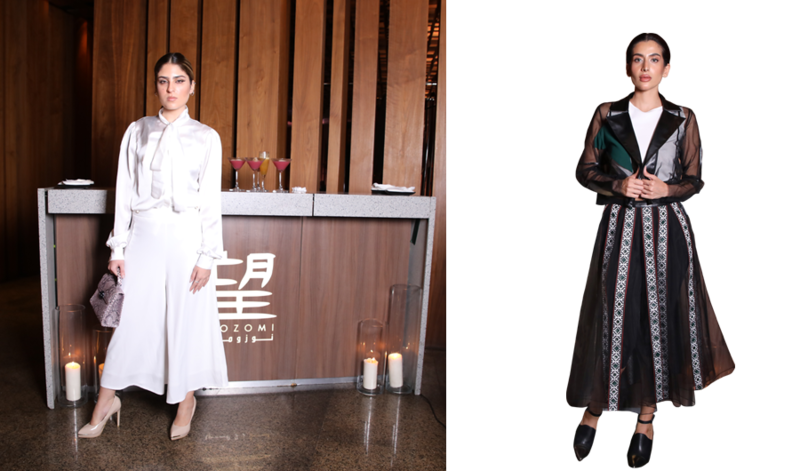 The participating designers showcased their latest fashion at Nozomi in a private and exclusive show. The princess, who is also the founder of Global Fashion House, and whose vision is to enable Saudi designers to emerge, aims to support them and on Monday had their work displayed. With background music playing loud and sushi and fancy drinks being served, the five emerging local designers opened the show. Shams hit the runway first with her designs. The one that stood out was a floor-length black chiffon dress that was short at the front and hit the floor with a meter-long train in the back, buckled securely by a red chiffon belt with a large flower at the back. Khawla Al-Harbi was second, with eclectic designs, and each one different. Her first design was white pants also supporting a top with a train and massive earrings and hold boots. Her designs were dominantly white, the last a long dress adorned in large silver fish scales. Mashael Al-Nassar’s designs were a unique blend of see-through fabrics, which was very modern and elegant. Ashwag Al-Mutairi’s collection featured white high-waisted pants and a sequined black top. Saja Yousef stood out with her all-white attire collection. The first was an ankle-length white dress and jacket which was the same color and length of the dress. But she has designed not only clothes but also bags, which the models showcased during the event. The invitees were impressed by the emerging Saudi designers. One exclaimed that they had the potential to be recognized worldwide, with a little more work and experience. Even at an all-female event, the guests were immaculately dressed, wearing exquisite abayas of different colors and designs. It was a fashion trunk show, after all. But most notable was an abaya by designer Nouf G, who was draped in a red Shomakh (red Saudi head cloth) abaya, with the other half of a light grey tribal design. “Each one of my abayas has a story. A unique story. I make one of each design only,” Nouf G said. After the top Saudi emerging designers finished, the Saudi favorites took over, with names such as Lum by Lama Taher, RE:UNITE, Hindamme and Mashael Al-Rajhi. Each of the designers had a unique and signature look. The Lum ball gowns were the essence of sophistication and femininity. RE: UNITE by Noora Al-Harthi was trendy and stylish. Hindamme by Mohammed Khoja featured the famous bomber jackets and cool attire galore. Al-Rajhi was a unique blend of tribal, color and artistic designs. The night concluded with fashion international stars Lama Askari and Tony Miranda. Princess Noura ended the night energetically as she said: “The attendance was more than we expected. We were getting last-minute calls to attend (the show was private and by invitation only). Everyone was so positive, in a good mood and very proud to show their work. “I am proud of these Saudi designers. Everyone was so stunned by their work. It was exciting and hectic.” After the show, many of the attendees asked to meet the emerging local designers to buy their designs. Asked which of the emerging designers was her favorite, the princess said: “Each one of them has their own style. Whatever is inside them came out today, I saw it. Copyright © 2018 Arab News. All Rights Reserved. Provided by SyndiGate Media Inc. (Syndigate.info).